With each WTTW Kids Club membership, you can enroll a child under the age of thirteen to receive a Birthday Greeting Card from a character from a WTTW and PBS Kids show! Just provide us with the information below to enroll. Birthday Greetings are sent to the mailing address you indicate on the next page. 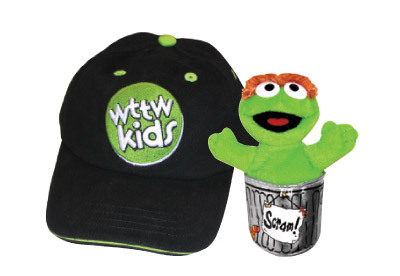 Features a sporty brushed cotton WTTW Kids children's baseball cap and a cute mini Oscar the Grouch plush toy.